How is the Real Estate Market Really Doing? 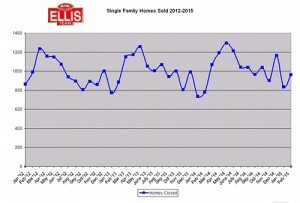 Home » How is the Real Estate Market Really Doing? A few weeks ago our real estate market update told you how new pending sales were on the rise and how that could lead to increased sales in February and March. Official new pending sales in February were up 21% and overall pending inventory was up 8.6% in February 2015 over last year’s numbers. That sounds pretty encouraging for upcoming March sales numbers when the final numbers come in. I’ve talked with real estate agents that didn’t feel like this January or February was particularly great, but agents tend to judge the market based upon their own sales versus the market’s sales. I can say back in January and February and some buyers did seem on the fence and indifferent, but the numbers don’t bear that out. The numbers suggest buyers were bullish. March is a different story. Buyers in March do seem interested and are buying. It will be interesting to see what official sales numbers look like. We have our first indications of inventory levels and sales levels from February. Official numbers were just released this week. 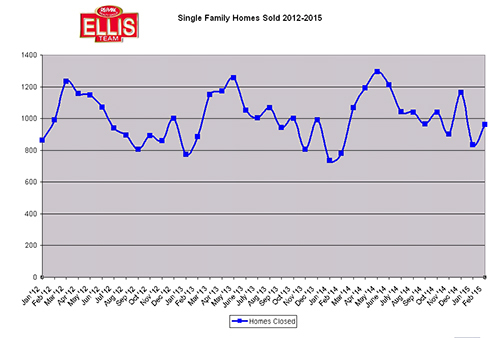 Single family home sales this year were 861 compared to 779 last year and 886 in 2013. They were 992 in February 2012 but we had more inventory to sell back then. 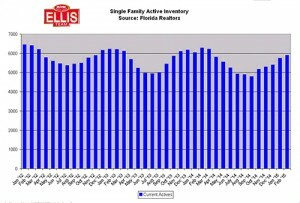 If you look at the Active Inventory graph you’ll notice our inventory is well below previous year’s levels. In fact, single family home inventory is down 6.1% last year, and if you remember we were complaining about low inventory levels last year. Median sale prices are up 6.5% this February and averages sale prices were down 2.6% We generally use the median home prices because it is more stable and less influenced by one or two large sales. We think agent’s attitudes will be up in March for two reasons. The first is the numbers indicate the market is doing well. Secondly, buyers on the street have stepped up in March and the feeling on the street is positive. There’s an old saying “Never let the facts get in the way of a good story.” This time around I think the facts will match the stories. We like to stick with the facts, although I know it’s human nature for people to work off emotions. There’s another old joke that asks the question “Do you know the difference between a recession and a depression?” The answer is, when your neighbor is unemployed it’s a recession. When you’re unemployed it’s a depression. The same goes for agents. When their business is up the market is good, and when their business is down the market must be down. When you’re interviewing agents, be sure they’re using market statistics and not general feelings. General market sentiment can be powerful, but there’s no substitute for actual real estate market facts. Bottom line is there is no substitute for hard work. My grandpa and dad said if you were a hard worker you were a “Hoss” There’s also no substitute for facts and market knowledge. When you combine market knowledge and hard work you have a recipe for success. You’ll notice some sellers will sell in a tough market and some sellers will not sell even in a Hot market. The difference is knowing the facts and doing the right thing at the right time. We can help you do the right thing today. Simply call us at 239-489-4042 or visit our website at www.Topagent.com You can ask for “Hoss” and one of our team members will get to work for you. Posted in Fort Myers, Southwest Florida Real Estate.Tagged Real Estate market, San Carlos Park Homes.